The cost of dental implants can be outrageous. The benefits of implants over other dental care, however, can be significant because they can entirely replace your missing teeth while leaving the other teeth intact. If you are interested in dental implants, try these options before ruling them out completely. 1. Determine what portion of the cost, if any, your insurance will cover. Dental insurance doesn't often cover a large percentage of dental procedure costs, but some plans do cover a fraction of the overall cost. Although it may not be a lot, every penny the insurance company will pay will help in the long run. 2. Discuss your options with your dentist. Let your dentist know if the cost of the dental implants is unattainable for you. Some dental offices that do implants may consider offering you a payment plan that would make the implants more affordable. Approach the payment office at your dentist and see if they allow such plans. 3. Ask your dentist if they discount multiple implants. Some dental offices have packages available to help make implants more affordable for their patients. Inquire if they have packages available, or if they provide discounts with multiple implants. 4. Find a dentist that performs all the steps. Dental implants involve many steps, and many times require both a surgeon and a dentist. If you can find a dentist who performs both the surgical and restorative work, you may save money, and there is one person who takes all the responsibility for the entire procedure, which is really important. You also save time this way because the provider is able to combine the visits. 1. Comparison shop. Before deciding, call around to get quotes from different dentists. You want to make sure you are getting the best quality care for the best price. Don't stop at dentists, though; periodontists and oral surgeons also offer dental implants. Make sure you have looked at all your available options. 2. Try a dental implant center. A dental implant center specializes in this kind of oral surgery. 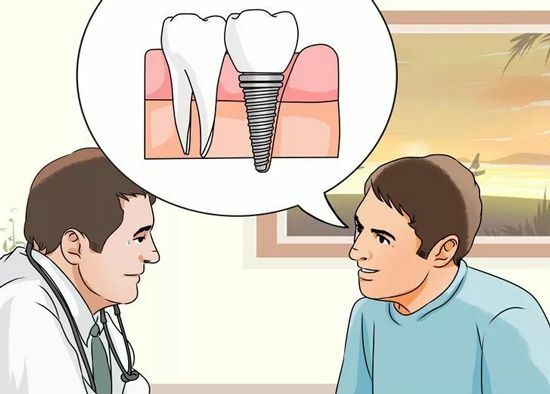 The center might charge less because dental implants are what they do on a regular basis, while your dentist might charge more because it is a special surgery. These centers also usually strive to provide lower treatment cost by having one surgical team to work on your mouth, instead of different specialists who charge separate fees. 3. Look into dental schools. Many college and universities have dental schools that provide dental care at reduced costs. Most of these dental schools have recently graduated students working alongside experienced dentists and professors. They may even have better medical equipment, such as computers that they use for guided surgery. 4. Finance your implants. Try health care financing, like CareCredit or Springstone. Some companies offer special financing for health care related costs at no interest or low, fixed interest rates. Usually these financing option require decent credit scores. If your credit score is low, you can get one or two cosigners on the application to get approved. 5. Look into low-income resources. Some organizations offer aid to low-income households who need dental care. Some non-profits and dental associations provide aid to certain demographics, such as people with disabilities, women and children, and others. 6. Get a dental plan. If your insurance doesn't pay for implants, there are dental insurance alternative plans that offer implant coverage. These plans usually require you to use dentists in their network. 7. Look into dental tourism. Dental tourism has become a popular method for high priced dental work. Dental implants are cheaper in other countries, such as Mexico, Hungary, Italy, Costa Rica, and many Asian countries. Sometimes, the same dental implants can cost half of the price it would in the US. 8. Consider making dental implants a top priority. If dental implants are something you really want and need, consider making that a top priority. Instead of buying a new car or taking a vacation, use that money to help pay for your dental health.